CHAPTER I. INTRODUCTION.—LORD COCHRANE'S ANCESTRY.—HIS FIRST OCCUPATIONS IN THE NAVY.—HIS CRUISE IN THE "SPEEDY" AND CAPTURE OF THE "GAMO. "—HIS EXPLOITS IN THE "PALLAS. 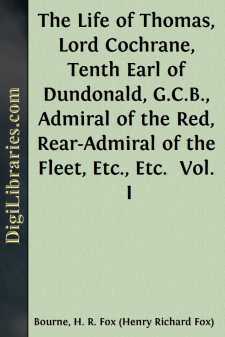 "—THE BEGINNING OF HIS PARLIAMENTARY LIFE.—HIS TWO ELECTIONS AS MEMBER FOR HONITON.—HIS ELECTION FOR WESTMINSTER.—FURTHER SEAMANSHIP.—THE BASQUE ROADS AFFAIR.—THE COURT-MARTIAL ON LORD GAMBIER, AND ITS INJURIOUS EFFECTS ON LORD COCHRANE'S NAVAL CAREER.—HIS PARLIAMENTARY OCCUPATIONS.—HIS VISIT TO MALTA AND ITS ISSUES.—THE ANTECEDENTS AND CONSEQUENCES OF THE STOCK EXCHANGE TRIAL. Thomas, Loud Cochrane, tenth Earl of Dundonald, was born at Annsfield, in Lanark, on the 14th of December, 1775, and died in London on the 31st of October, 1860. Shortly before his death he wrote two volumes, styled "The Autobiography of a Seaman," which set forth his history down to 1814, the fortieth year of his age. To those volumes the present work, recounting his career during the ensuing six-and-forty years, is intended to serve as a sequel. Before entering upon the later narrative, however, it will be necessary briefly to recapitulate the incidents that have been already detailed.